Doesn’t that just sound like it should be a book title? While there isn’t a book out with the above title just yet (maybe I should write it! ?) I figured it’d make for an excellent, post-New Year’s check-in blog post, especially since financially successful women tend to be successful women, period. Why is this? In my experience, financial goals tend to be the “linchpin” goal for most people. In other words, it’s the one life area that holds many of our other life areas together. Whether you have a dream of traveling, starting a business, giving more to charity, moving across the country, or even eating healthier, most goals are easier to achieve if you have a little change in your pocket. 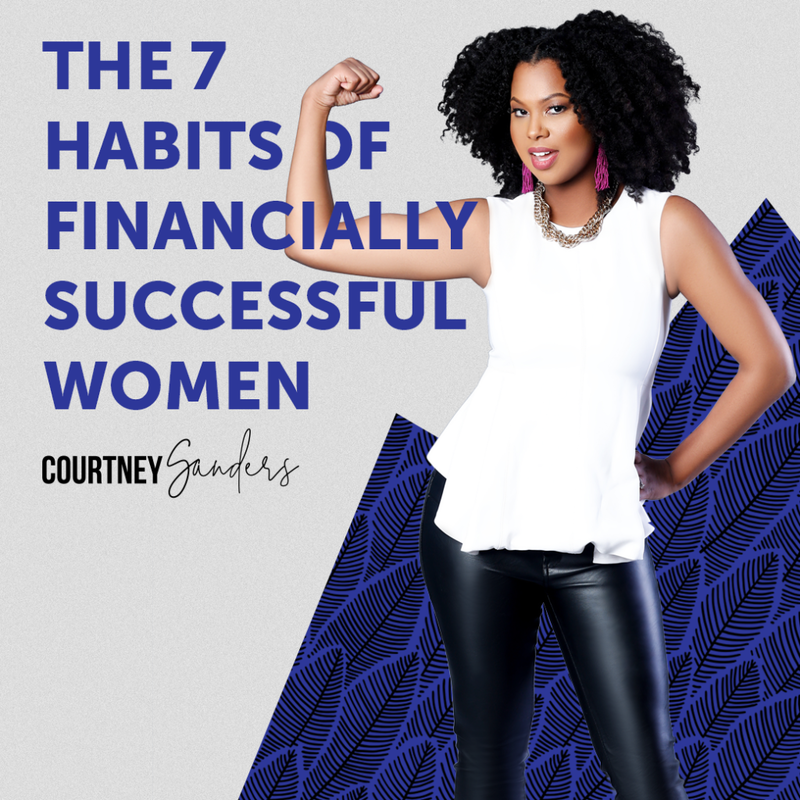 The ability to consistently save money is the number one habit practiced by financially successful women – and for good reason! Not only is having a well-funded savings account extremely important during financial hardships, it allows you to take advantage of financial opportunities. If you do not have the habit of saving, you also don’t have the habit of investing. And it is investing – whether in vehicles like stocks, real estate, or (my favorite!) your own business – that will allow your money to earn money without you needing to continue to work. Thus, a dollar saved truly is a dollar earned. Training yourself to automatically put away a portion of what you earn is truly the foundational step to financial independence. As an added bonus, not only will this practice increase your financial success but it will increase your overall discipline, which translates to success in every area of your life. 2 – …but they don’t forget that a dollar earned is a dollar earned, too. Financially successful women are overwhelmingly unafraid to negotiate and ask for top dollar when it comes to compensation. If they feel they can’t legitimately insist on higher wages due to a lack of skill, knowledge or experience, financially successful women will do what it takes to improve their deficient areas so that they can command higher earning. 3 – They protect their credit. Credit can be a powerful tool if used wisely but too many treat it with little more responsibility than they would monopoly money. Financially successful women are diligent about not carrying balances on credit cards and paying their bills on time because they know that past-due bills and delinquent accounts reflect poorly on their credit report. Not only is a low credit score NOT cute but it often translates to higher interest charges, an inability to obtain a mortgage or business loan, and even denied job applications. With this in mind, financially successful women never avoid looking at their credit report – in fact, they check it regularly! My favorite – and free! – way to do this is through Credit Karma. Credit Karma is an online credit monitoring service that provides you with your credit score, credit report, and will even alert you to any changes through daily credit monitoring. I started using Credit Karma back in 2013 and they alerted me to a change on my report that ended up being an error. I was able to write the credit bureau and get it removed but I never would have known about it had I not signed up for Credit Karma. So if you’re looking to develop the habit of protecting your credit and you want a 100% free way to do it, definitely check out Credit Karma. 4 – They’re always increasing their financial knowledge. Financially successful women aren’t content with only knowing how to balance a checkbook (does anyone even do that anymore?) and follow a budget. They’re always seeking new ways of getting the most of their money and aren’t afraid to buy books, attend classes, and go to seminars to learn more. The greatest thing about increasing your financial IQ is that it increases your financial confidence. And this is critical as far too often, women DON’T feel financially confident, as evidenced by the findings in the 2014 Global Financial Literacy Survey. According to the report, women were significantly more likely to answer “I don’t know” to simple financial literacy questions than men. 5 – They work with (trusted) professionals. Though financially successful women are financially smart women, even the smartest woman knows she can’t possibly know everything… which is why financially successful women overwhelmingly work with accountants, attorneys, financial advisors and tax professionals. One of my favorite female CEOs (and a very financially successful woman! ), Myleik Teele, credits her long-time accountant with helping her take her finances to the next level. The key, however, is not to just work with anyone but to work with a professional that is skilled, knowledgeable, and (preferably) comes highly recommended. A good professional can ensure your accounts are setup correctly, your retirement is on track, and your taxes are properly planned for. Financially successful women know that while financial professionals do cost money, a good one will often save them money in the long run. 6 – They build multiple income streams. Financially successful women know that “more is better” doesn’t just apply to shoes…it applies to income streams as well! While the average, American woman has 27 pairs of shoes but only one source of income, money savvy women are always on the lookout for new ways to earn money. In an era where both employees and employers are increasingly less loyal, it’s important to have a variety of ways to monetize your skills and earn income. Financially successful women often earn money not just from a traditional job but through other sources such as business, real estate, personal services, sales commissions, intellectual property, royalties, interest income, and financial investments. Financially successful women take inventory of what they’re good at and seek different ways to monetize it so they always maintain their financial independence. 7 – They care about money! Last but not least….financially successful women care about money! Because financially successful women ultimately care about freedom, they do what it takes to remain financially free. Disclosure: CreditKarma.com, which I’m a huge fan of (see #3), sponsored this post! I happily accepted their sponsorship as I’ve been using their service for over 3 years and have mentioned them in previous blog posts prior to this sponsorship. Best of all, Credit Karma is 100% free! To sign-up for Credit Karma and instantly check your credit (yes it’s legit and no they won’t ask you for your credit card number), click this link.